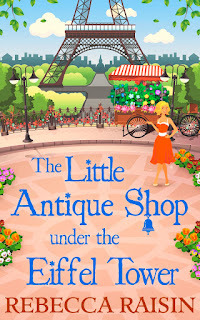 The Little Antique Shop under the Eiffel Tower by Rebecca Raisin was released this week! You can read my review here, and check out an excerpt below! The most rewarding part of my job was seeing a customer’s eyes light up when they took delivery, their hands finding their face, mouths hanging open, and the still of the moment, as if time stopped as two worlds collided. Past and present. Then and now. Using the hutch, I knew that Marie would have an epiphany, an idea that hauled her from the well of writer’s block; was it her subconscious, or was it Anaïs, giving her a ghostly hand up when the words wouldn’t flow? You would have been surprised how many customers called me with shy voices and told me stories about their antique, and how they were visited by ghosts – the former owners checking in. As if every now and then, they traveled back from their fluffy perch in heaven to check their beloved antique was still being cared for. It was especially true for antiques used by artistic people. They found it that much harder to let go and move to the next place. A violin from the early 1800s was heard during the night, the soft lament of the strings ringing out as the new owner was roused from sleep and followed the sound, catching the curtain shiver once or twice, even though the windows were locked tight, and the door bolted. Or a typewriter, once used by some robust, whisky-fueled writer, would suddenly come to life, its keys clacking in the dark of midnight. It was just a brief visit to touch base with the precious medium that made their art immortal. The clink of a glass to whisky bottle heard, a goodbye, before silence enveloped the room once more. Even I’d had a visit. I had an old clock, once owned by a fifties’ French actress who was notorious for arriving late on set, and then staying up all hours with whatever beau took her fancy. When I first took the grandfather clock home, it would tick tock louder at the witching hour, as if it was greeting her, and I wondered if I sprinted to the living room if I’d catch her curvaceous shadow caught in moonlight as she revisited the one thing that always beat her in her life – time. She died tragically, young and beautiful, and in the afterlife chased the thing that had evaded her.